The Gay Gamer: Could Tank Troopers (3DS) be Nintendo's next Splatoon? Could Tank Troopers (3DS) be Nintendo's next Splatoon? There was a lot to "ooh" and "ahh" about while watching the trio of 3DS-focused Nintendo Directs that were broadcast in Japan, Europe, and North America yesterday. Some of the many announcements that elicited those responses from yours truly: the out-of-nowhere Super Mario Maker and Yoshi's Woolly World 3DS ports (both of which will hit store shelves around the world within the next few months), the Pikmin side-scroller (also for 3DS and due out sometime in 2017) and the mysterious retail 3DS title known as Miitopia that'll at least see the light of day in Japan by the end of this year. Want to see it in action? Skip to the 36:30 mark of the North American Nintendo Direct. Admittedly, the video footage above doesn't offer up a ton of details about the game. 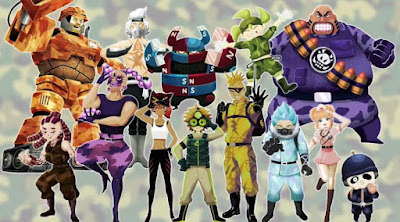 Still, it's clear it focuses on crazy tank battles and a colorful cast of characters that look as though they were conjured up by the same artists who worked on Splatoon, and that's enough for me (at least for the moment). My only concerns right now: will Tank Troopers be a digital-only release or both a digital and retail one? (At least one piece of PR associated with the title says it'll be both, but I can't help but think someone made a mistake in saying a boxed version is in the cards.) Also, no online mode was mentioned in any of the Nintendo Direct descriptions of the game, which is worrisome. Would I pass on Tank Troopers if it's digital-only and doesn't allow for Internet play? Not necessarily. After all, it looks like a lot of fun and also sports the kind of pizazz and sass that always appeals to me. Still, I'd prefer a boxed release and the ability to compete on line. Am I alone in feeling stoked about Tank Troopers? And am I alone in thinking Nintendo could have another Splatoon-like hit on its hands--especially if it somehow includes an online mode that's yet to be discussed? Share your thoughts in the comments section that follows.